Fret work is an art form that dates back to the 1700's, and it has become my favorite hobby. Click on the hummingbird to see different examples of fret work. 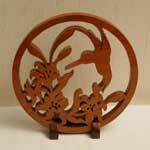 My favorite scroll saw projects are made from patterns from the Victorian era. Click on the sleigh to see more fret work projects. Intarsia is also an old art form. The piece is made by cutting and shaping different woods to form a 3D object or picture. Click on the snowman to see more intarsia projects. Baskets that are made using a scroll saw are cut from two different patterns. Multiple pieces of each pattern are alternated to create a "woven" look. Click on the basket to see more projects. Relief is a technique that requires the scroll saw table to be tilted to the left or the right, while the blade remains vertical. Depending on the degree of the table tilt, and the direction of the cut, the sawn pattern will either be raised or recessed. Click on the basket to see more relief projects.